I have been experimenting with a small MP3 player that is available THIS ITEM APPEARS TO BE DISCONTINUED BY THIS VENDOR on eBay for less than $5.00 (see: http://www.ebay.com/itm/281387900991?_trksid=p2059210.m2749.l2649&ssPageName=STRK%3AMEBIDX%3AIT or search eBay for TF Card MP3 Voice Module tf-16p. ) 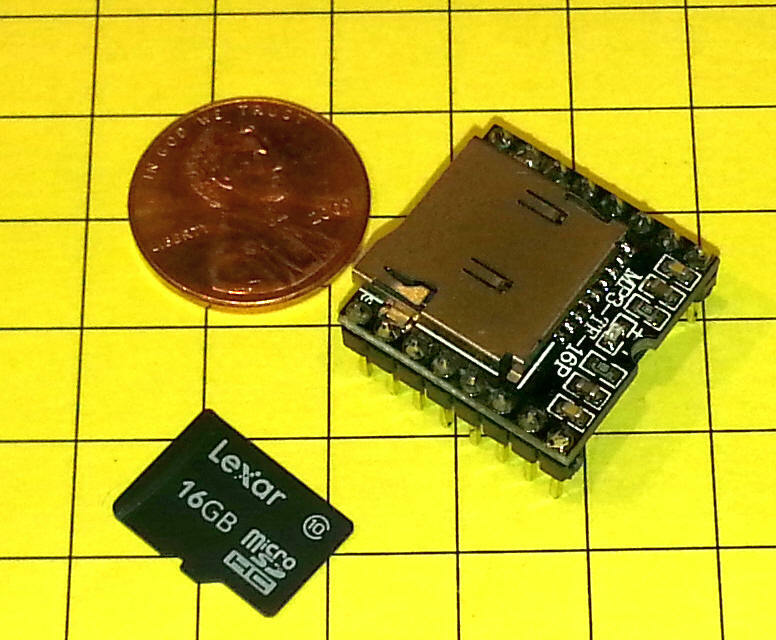 The 16 pin device is less than 1" square and accepts a micro SD memory card. My first project with this module was to build a talking temperature device using an Arduino Pro Mini. The MP3 player is shown here along with the pin descriptions. 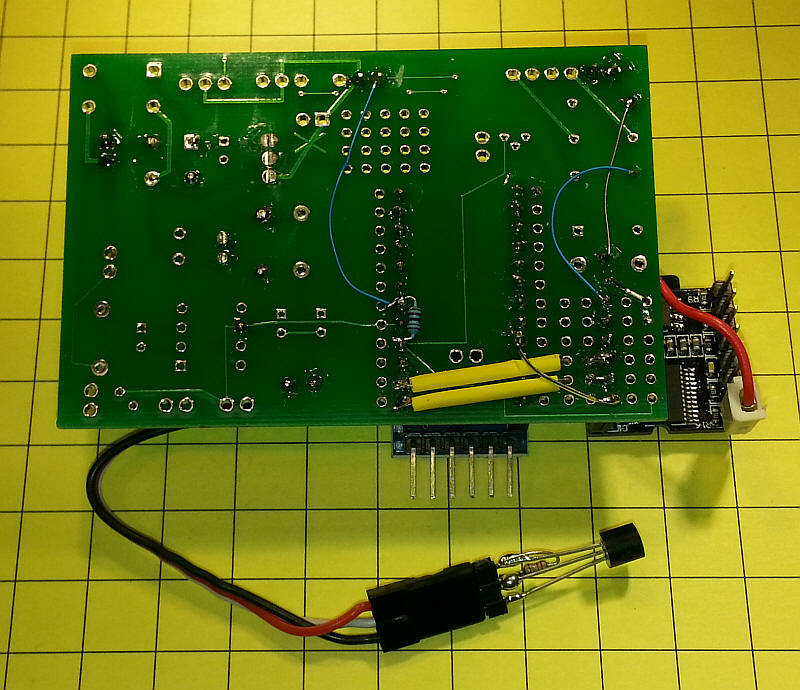 It operates on 5 volts and is controlled via the RX & TX pins. There are two speaker outputs, one (labeled SPK_1 & SPK_2) can drive an 8 ohm speaker directly, The other output is line level and supplies stereo sound. 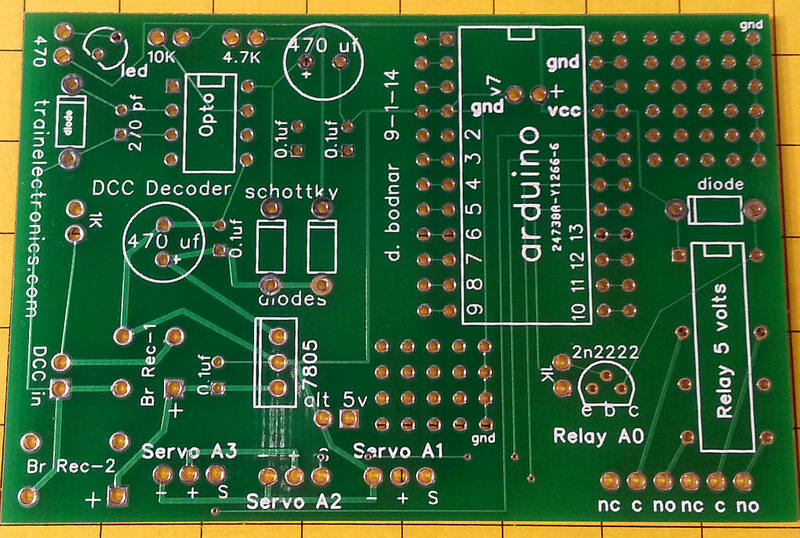 For this output use GND, DAC_R and DAC_L. While the board can be connected to a number of different Arduino versions I chose to use the Pro Mini as I wanted the completed unit to be fairly small. 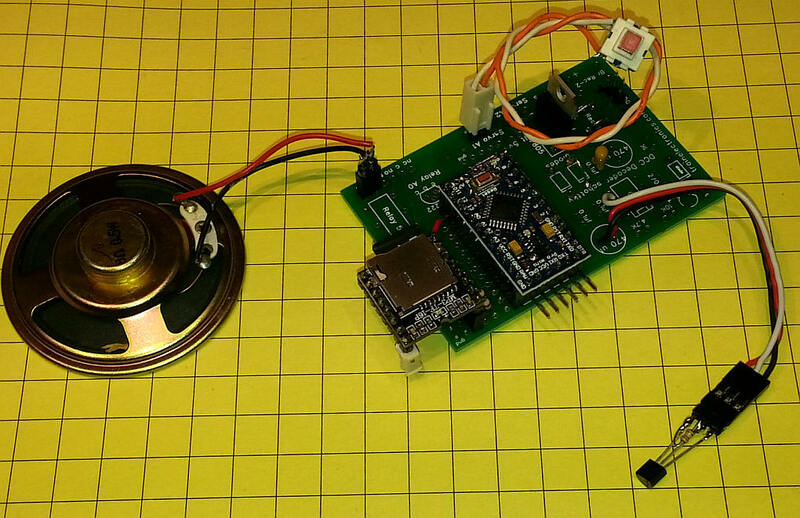 The Mini and the MP3 board run on 5 volts which is supplied by the 7805 voltage regulator. The connections to the MP3 board include the TX, RX and BUSY pins. The 1K resistors on the RX / TX connections are not absolutely necessary but are recommended. 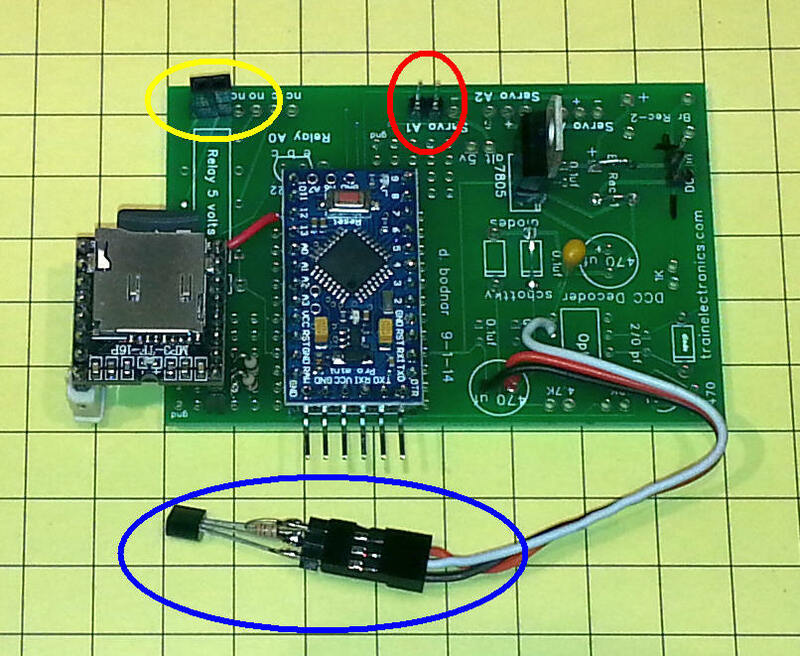 The temperature sensor (DS18B20) connects to +5, ground and pin 2. A 4.7 K ohm resistor goes from the sensor's output pin to +5 volts. A push button switch is connected to pin 3 and is used to trigger a spoken temperature report. Note that the pin is held low by a 10K resistor until the button is pressed. The schematic shows the connections. If the Uno is used the voltage regulator section of the circuit is not needed. I connected an 8 ohm speaker to pins SPK_1 and SPK_2. A good speaker supplies more than enough volume for testing and many other applications. The board that I used to build the test unit is one that I designed and had fabricated for a model railroad DCC project (see: http://www.trainelectronics.com/DCC_Arduino/Decoder_board/index.htm . 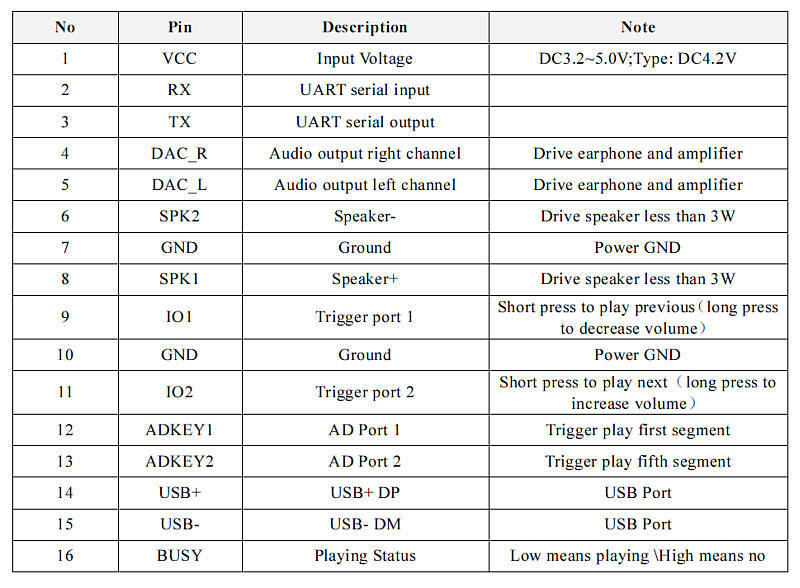 Many of the DCC specific parts of the board. The MP3 module doesn't quite fit on the board and extends a bit to the side. The speaker connection is circled in yellow, the button connection in red and the temperature sensor in blue. A bit of rework was necessary on the back of the board. The red wire in the lower left connects to the BUSY pin on the MP3 module and pin 10 on the Arduino. The MP3 files include the numbers 1-9, zero, and the words point, degrees and Fahrenheit. The files are named 0001.mp3--0009.mp3 for the digits 1-9, 0010.mp3 for zero, 0011 for decimal, 0012.jpg for point, 0013.jpg for degrees, 0014.jpg for Fahrenheit and 0015 for Celsius. The files that I used are here: Arduino/MP3Sound/TalkingTemperature/Numbers-etc.zip The original files with more descriptive names are included, too, but all that is needed in the mp3 directory are the numbered files. If your files don't play in the expected order you may need to use the utility DriveSort, found here: http://www.anerty.net/software/file/DriveSort.php - it will reorder the files in a manner that should have them work as named them. The Arduino software requires a few libraries to be installed. These include the MP3 library and the DS18B20 temperature sensor library. IMPORTANT: There are also a number of other libraries and routines that are included in this code that are there for the next project, that of building a model railroad defect detector. You can ignore the LCD display references and those for the lasers and photo transistors. None of these items needs to connected to have the temperature reading program work properly. To activate speaking temperatures make sure that the button attached to pin 3 is closed. There are also a number of Serial Terminal debugging statements that will display status information on the Serial Monitor. Once the MP3 files have been created and saved on the micro SD card in a directory called /mp3 this program can be used to speak each file in order. It outputs its progress to both the LCD (optional) and serial monitor - I find that I sometimes have to hit the reset button on the Arduino one or several times to get the sound card to initialize the first time - if a "click" from the speaker is heard upon reset or initialization the device will talk.